Residents of Alagarmalai village in Ullatti Panchayat located on the Masinagudi Ghat Road in The Nilgiris picketed a Tasmac outlet on the road seeking its closure. B. Nanjappan of the village said that the outlet is located around 50 m away from a government primary school. “The shop is located between Alagarmalai and Thalaikundha. On many occasions vehicles of tourists have met with accident as they were driven after consuming alcohol. Drunkards pick up a quarrel with villagers, and behave indecently with women and children", he said. The villagers have petitioned the Collector many times with the demand. 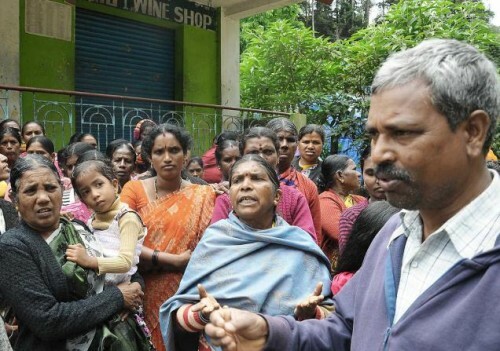 Villagers staged a demonstration on Tuesday as the Chief Minister’s announcement for closing 500 Tasmac outlets in the first phase has given them hope that the shop in their locality too would be closed. They wanted the shop to be included in the list. The District Collector,asked them to give him a week’s time.